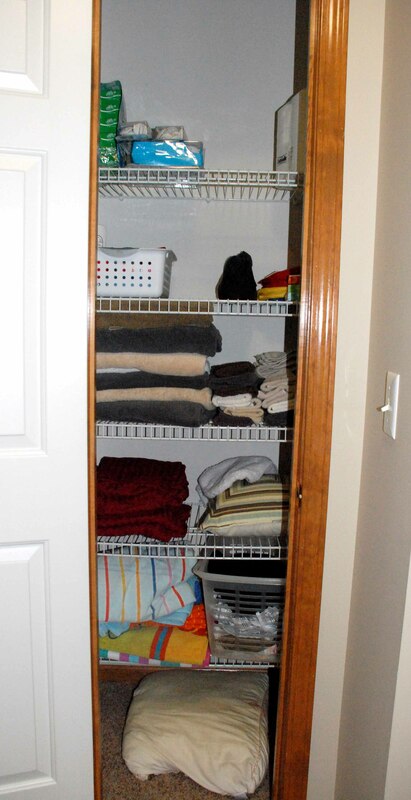 So on my February “to do list” I had – reorganize the linen closet. I am oh-so grateful that we have a linen closet! It’s upstairs in the hallway by all of the bedrooms, so it’s in a very central location that all of the bedrooms/bathrooms can utilize it. I can’t really say that the linen closet was really messy or just packed full of stuff, but it just needed something to perk it up a little 🙂 This is what it looked like before..
A pretty typical, small linen closet that just had a bunch of stuff on the shelves. The plastic milk crate things were only $4 a piece, the smaller plastic baskets were $4 too (I think) and I splurged on the zigzag bin for $7. Totaling a whopping $31. So much better right? A couple days after I added the new storage bins, I had already forgotten about my makeover and I went in there to grab something and almost startled myself at the bright, cheery, happy place I call my linen closet!